"Excellent roast beef with plenty of juices which can be thickened for gravy." Pour soy sauce and dry onion soup mix into the slow cooker; mix well. 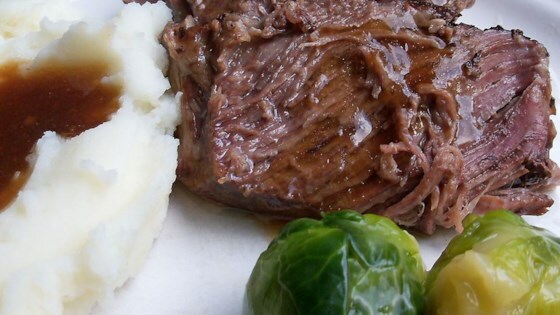 Place chuck roast into the slow cooker. Add water until the top 1/2 inch of the roast is not covered. Sprinkle ground pepper on top. Cover and cook on low for 22 hours. Wow. Unless you modify this recipe, be prepared to drink a gallon of water. It is saltier than a can of sardines! Put a 3lb roast in at 7am, put in carrots and potatoes at 1pm, and ate at 6pm. It was perfect! Used low sodium soy. Will do this often.